Microsoft Scripting Guy, Ed Wilson, is here. Last week, the Scripting Wife and I were at the Windows PowerShell Summit in Bellevue, Washington. It was an awesome week. We got to reconnect with many old friends, and we also made new ones. I delivered three sessions on Wednesday. Needless to say, I was a bit tired. In fact, the entire week was tiring. I am talking about 16-hour days, and a three-hour time zone change kind of tired. But the energy was buzzing around; and therefore, it was awesome. Before one of my sessions, I decided to get a cup of coffee. Someone saw me and said, “What are you doing with coffee? Don’t you usually drink tea?” Well, yes I do, but I thought I would go for the "hard stuff" to provide a little extra jolt before my session. Ride while it is sunny. 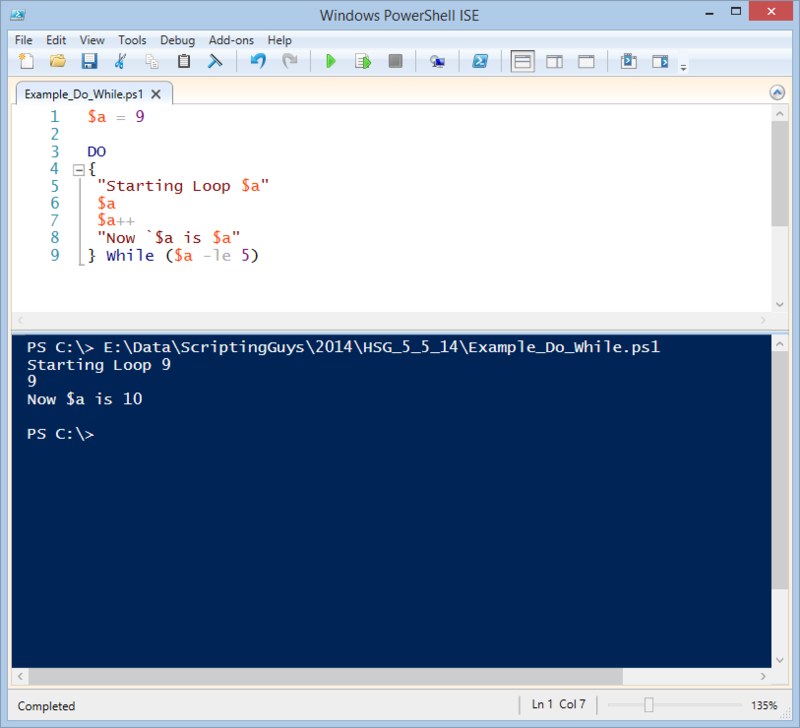 Now I want to take a look at a real Windows PowerShell script that illustrates using the Do…While loop. So, I can see that there are four parts to a Do…While loop. First is the Do keyword, then the script block that I want to “do.” Then comes the While keyword, and the condition that is evaluated to determine if another loop will occur. In many respects, the While statement and the Do…While loop are similar. The difference is that with the While statement, the condition is evaluated to determine if the script block will take place. In the Do…While loop, because the condition occurs at the end of the loop, it will always loop at least once. This is illustrated in the image that follows. I use exactly the same script as I used previously, but instead of setting the value of $a, I assign a value of 9. Now, 9 is greater than 5, so the ($a –le 5) condition is never true. Yet, as you can see in the image, the script block ran once. In the following image, I see that it took me a few seconds to close Notepad. 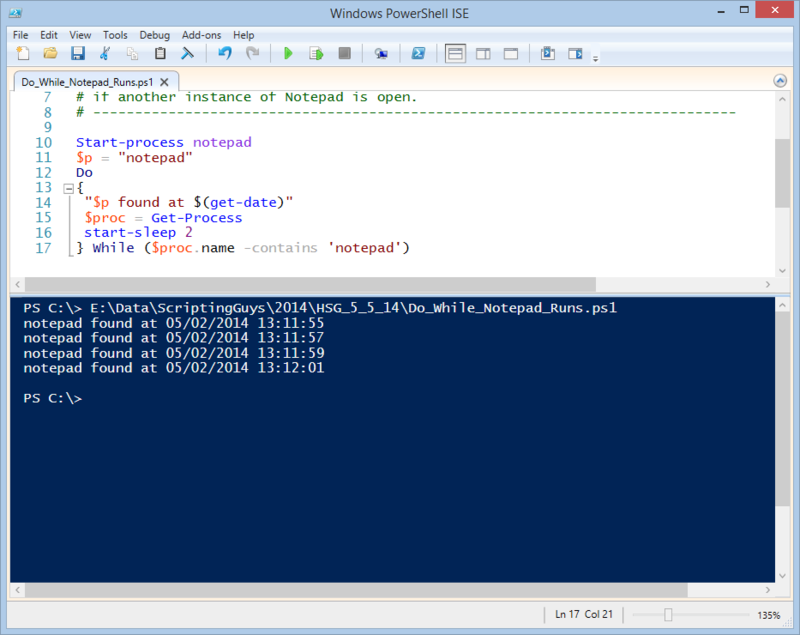 When I manually close Notepad, the looping stops. 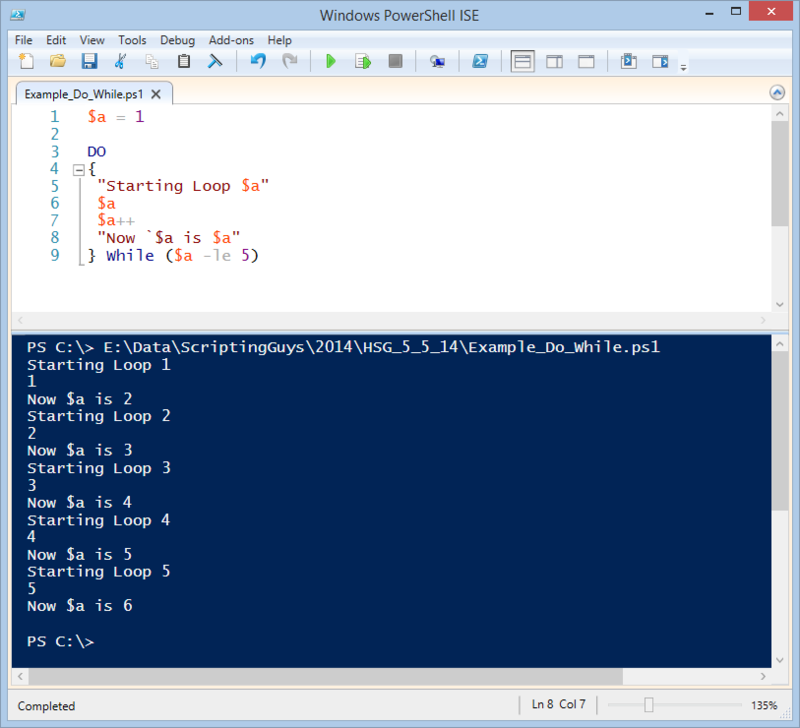 Windows PowerShell Fundamentals Week will continue tomorrow when I will continue talking about looping.